+ImpaKT has been invited in 2018 to represent Luxembourg in the Management Committee of COST Action 17133 on “Implementing nature-based solutions for creating a resourceful circular city”, together with Jo Hansen from University of Luxembourg and Benedetto Rugani from LIST. On 13-15 February took place the first working group meetings at BOKU in Vienna and we invite Luxembourg stakeholders who develop or work on nature-based solutions in the urban landscape to get in touch and exchange knowledge and best practice. The COST action CIRCULAR CITY intends to tackle the challenges linked to resource depletion, climate change and the degradation of ecosystems caused by the growing urbanization worldwide. Nature-based solutions (NBS) can provide a range of ecosystem services beneficial for the urban biosphere such as regulation of micro-climates, flood prevention, water treatment, food and material provision, etc. 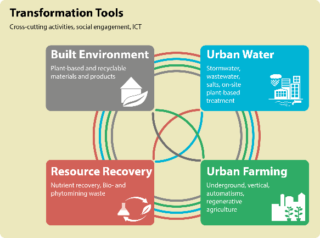 By adopting the concept of a circular economy and combining these solutions in a holistic way resource cycles within the urban biosphere can be closed and socio-economic and environmental benefits generated. For more information please visit also INFOGREEN.